Performance Today Is Not About Doing More, It Is About Being Better. Let’s change the way we think about performance and productivity, because even though time is our greatest challenge, health is the foundation for peak-performance, that can transform the workplace from a burnout-culture running on stress and survival-mode to a culture driven by care, purpose, focus and engagement. Because when we leave our self-care at the door when we go to work, we leave behind our most important resource, our humanity. Jeanette Bronée at the UN Headquarters on health at work. Jeanette Bronée at the UN Headquarters on mental health at work. Inner Fuel - The Key to Human Performance and Longevity at the Plenæ Conference in Brazil. Copyright Jeanette Bronée 2018. All Rights Reserved. TEDx PSU Behrend 2017 - How to Feed Creativity. Why Book Jeanette to Speak? Jeanette is helping people and companies work better by working healthy. She is an inspirational performance and culture keynote speaker on the topic of why we need to bring self-care with us to work in order to master our attention, perform better and be more engaging leaders. She shows how we can obtain both personal and organizational health, optimize our personal and professional ROI and achieve sustainable success by creating a company Culture of Care™ where everyone is nourished. 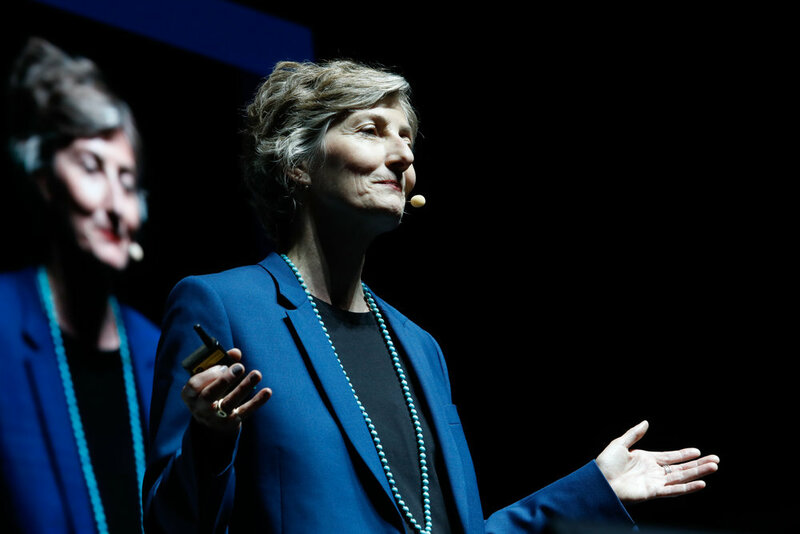 Jeanette teaches us how to achieve work/life quality by integrating tech and humanity at work, without losing our health to stress and burnout, and access our core human resources for peak-performance by asking better questions. She speaks about the challenges we face to change our habits and gives us the tools to learn how to thrive in a busy world. Her approach inspires change in an easy to understand, non-dogmatic way. Her goal is to empower her audience to take charge of their health and work-life habits, enhance their physical, emotional and mental resilience, master their attention and their time, decrease stress and increase their performance by changing the way they work. Jeanette is on a mission to humanize the way we work, so we can be our best self at work and have better work/life quality. She has been coaching leaders for the past 15 years on how to use self-care as a tool for peak-performance and physical, mental and emotional resilience. She speaks about why we need to access our human skills to be better leaders and how we can ask better questions to understand what fulfills our human needs and create a culture of C.A.R.E. She shows how to use self-care habits to achieve peak-performance and fulfillment and nurture a work-culture that is fueled from the inside out - without the survival-stress and burn-out. Jeanette Bronée. CEO & Founder of Path for Life. International Keynote and TEDx Speaker, Performance Strategist, Work-Culture Coach, C-Suite Advisor, Author and Nourishment Expert. Certified Integrative Nutrition and Meta-Medicine Health Coach, Mindfulness and Focusing Teacher, Hypnotherapist. But don’t worry, she doesn’t do tricks.